Welcome to the Modest Sister Missionary Clothing Directory! This is a collection of shops vetted and approved by me to provide a quality selection of modest sister missionary clothing for sister missionaries shopping and packing for their missions! LDS Sister Missionary clothing standards require clothing to be loose fitting dresses and skirts that cover the knees and dresses and tops that cover the shoulders with modest necklines. Bright happy colors and prints are encouraged, though extravagance to the point of it distracting at all from your name tag or your message is discouraged. Clothing should easily allow for daily missionary activities like walking and sitting. If you haven’t yet received your mission call, you may find it best not to stock up on clothing items too much just yet until you know what kind of conditions you will be serving in, as climate and expected walking/biking/hiking will vary greatly depending on your call. See the official Sister Missionary Dress & Grooming Guidelines published by the Church of Jesus Christ of Latter-Day Saints. This darling online shop is overflowing with modest skirts and dresses! Perfect for daily missionary wear! Original modest dress designs mixed with sourced dress boutique goodness. Designer Carissa’s original casual and dressy dress designs are absolutely amazing and affordable! An adorably modest clothing company with a mission and a large collection of modest dresses in all sizes to prove it. These dresses are slightly fancier and are best for city missions, Sundays, or the MTC. Downeast Basics will forever be my first modest-clothing love. From their life-changing layering tees to their adorable modest dresses and skirts, you’ll LOVE this site! This darling online shop is overflowing with modest skirts and dresses in only the cutest of styles! An online modest clothing shop with affordable modest dresses perfect for daily missionary wear! This shop sells colorful, breezy mumus or mexican dresses covered in typical embroidery making each piece uniquely different. These lightweight sundresses are perfect for saying cool and modest in the hot summer! One of my newest modest shop discoveries with one of the cleverest of names! A new online shop selling only modest clothing, specifically modest skirts and dresses! An online modest shop selling only modest clothing from modest skirts to dresses to cute modest tops! An online modest shop with an original modest clothing line. A collection of adorable reversible skirts, perfect for Sister Missionaries packing their entire wardrobe into a few suitcases! An Etsy shop full of comfortable modest dresses in fun prints and patterns for you and your little ones! Mikarose is overflowing with darling dresses and skirts that are as modest as they are modern and flattering. This little gem of an online boutique as got their style down to an art! From the zippers to the pockets to the stripes I love everything this site releases! Keep an eye on their cute midi skirts. Modest tops and other modest clothing in addition to lots of modesty essential pieces. A modest clothing company selling it’s own original modest dresses you can’t find anywhere else! A platform full of many of these modest shops listed here are and more where modest shops sell their collections. Think of it as an Etsy of modest fashion! All of the modest dresses and skirts, could possibly crave all in one cute online shop. Modest sleepwear in so many adorable prints and colors perfect for the MTC and missionary apartment pajamas! Beautiful modest dresses and skirts. Modest skirts and dresses for days fill the collections of this online shop and adorable insta feed. The girls running this online shop have both inspiring taste and standards I admire and crave! They recently released a new line of of modest cotton dresses in cute prints! An online boutique featuring a collection by one of my favorite bloggers, Maskcara! Modest dresses fit for Sundays, bridesmaids, temple days, and lunch dates! Modest skirt and top sets designed especially for sister missionaries and wearable by all! Every item is handpicked by a modest blogger Modestly Hot with modesty and fashion in mind. A one-stop-shop for everything a sister missionary needs from clothing to shoes to bags! Modest basics, tops, skirts, and dresses! Vintage-inspired modest dresses with 3/4 length or long sleeved dresses and midi or maxi length hems! Customize their bridesmaid dresses in your color, choice of sleeve length and choice of hem length! One of my favorite new modest online shops because of the sheer number of modest skirts and dresses! Beautiful modest skirts you already love since you’ve probably seen and repinned on Pinterest! The perfect sister missionary bag! This bag will save your back on your mission because instead of wearing it like a backpack, you buckle it around your waist, letting your hips (where women carry weight most easily.) It can easily be worn walking and hiking all day. It easily swings around to the front for easy access and has lot of pockets for storage. It has reflectors, durable fabric, & a rain cover. Hi, my name is Emily! Modest Goddess is my modest fashion blog where I share modest outfit ideas (which I've sorted into 4 categories), modest brands (which I've sorted into 5 directories), and modesty hacks (how to dress modestly regardless of immodest trends)! You can find all of these via the menu tabs above! 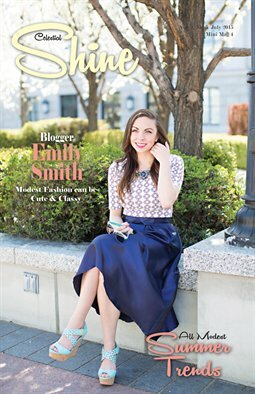 Visit Emily Smith's profile on Pinterest.